P. melanantha is well known from the Zheduo Shan, West Sichuan, China. 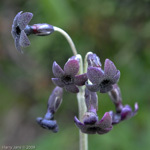 The extremely dark purple, almost black, flowers are unmistakeable. John Richards had described this as the species P. euprepes, however the name P. melanantha has priority and P. euprepes should be considered a synonym.